An industrial scale mill for just outside the village of Goodwood has been proposed. The company behind this mill is called Grainboys Holdings Inc. It operates a grain processing business called Port Royal Mills located in an industrial park in the Town of Aurora. The company wants to move its business to Goodwood where it will build a larger mill on protected Oak Ridges Moraine land. Goodwood residents launch fundraising drive to fund appeal. April 22 – Goodwood residents know that if Grainboys is allowed to build its grain mill in Goodwood the adverse effects on the hamlet and the community will be devastating. The risk of an explosion, the dust, noise and traffic, and the depreciation of home values are just some of the real concerns residents have. Already at least one resident is having trouble selling her home. Her buyer wants to back out of the deal because of the mill. Residents are asking themselves, who would want to move here if a mill is coming? The Goodwood Conservation Association, which aims to protect the hamlet from unbridled industrial development, is moving forward with plans to appeal the Grainboys decision to the Local Planning Appeals Tribunal. After a well-attended meeting with residents held last Wednesday in Goodwood, the GCA decided to hire an experienced professional planner and an expert lawyer. The GCA also launched a fundraising campaign to raise funds for a war chest to fight a town council that does not care about the community and approved the mill despite strenuous objections from residents. With the deadline for filing an appeal only days away, residents are urged to give generously as soon as possible. Council's misguided approval was just round one. 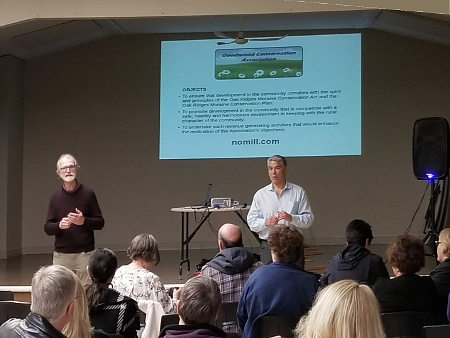 April 18 – Around 75 residents met at the Goodwood Community Centre on Wednesday night to discuss next steps after Uxbridge Council approved the Grainboys zoning bylaw amendment a week ago Monday. The meeting was organized by the Goodwood Conservation Association. David O’Leary, a member of the Association, the told residents why the mill will be a major fire and explosion hazard, and how Grainboys neglected to mention anything about this risk in its application documents. Mr. O’Leary said that the mill will be rated a “High Hazard Industrial Occupancy” operation because of the explosive nature of milled grain dust. Placing such an operation close to a residential neighbourhood just does not make good planning sense, he said. Because it lacks an aerial ladder truck, and because there are no pressurized water hydrants in the area, Uxbridge fire department will be ill prepared to fight explosion and fire at the plant. One resident suggested that the Ontario Fire Marshall should be made aware of the situation and that the township is putting residents at risk. Conrad Richter, president of the Goodwood Conservation Association, gave an overview of the appeal process. When local councils make bad planning decisions, like approving the Grainboys mill, residents can appeal to the Local Planning Appeals Tribunal, which is what used to be called the Ontario Municipal Board. But residents have only 20 days file their appeal once Uxbridge Township issues its official notice of decision. That notice was issued on Tuesday, and residents began receiving notice letters from the township in the mail yesterday. With the notice now issued, the deadline for filing the appeal is May 6. An appeal will require hard work and commitment from the residents, said Mr. Richter. For the organizers the response from residents was very encouraging, as many signed up to join the association and to pledge money for the fight. Mark Joseph, from the Deer Ridge neighbourhood, and emcee for the evening, thanked the residents for coming out in force – on a Maple Leafs playoff game night no less! He told residents to stay tuned for further developments. Goodwood residents angry at mayor and councillors. April 9 – Uxbridge Council voted to approve the Grainboys application to build a grain-processing mill in Goodwood at a raucous meeting yesterday at Uxbridge Arena. The vote was unanimous, with five councillors and the mayor voting to approve the zoning by-law amendment recommended by the town planner. Pamela Beach, the councillor for Ward 1, which includes the hamlet of Goodwood, recused herself, declaring that she has a “perceived pecuniary interest” in the Grainboys matter. Although she had recused herself since February 4 whenever Grainboys was discussed, at this meeting she claimed that she was “bullied by the residents” drawing derisive laughter from the crowd. Residents said later that they had not heard of anyone bullying the councillor. Some believed that Councillor Beach was referring to a conflict of interest complaint lodged by a Ward 1 resident in March. A large contingent of farmers were on hand to support the application. Many had provided little or no input in the Grainboys matter previously, leading some Goodwood residents to suspect that their presence had been orchestrated by elements pushing for the mill. Residents listened as two deputations were made by pro-Grainboys farmers Howie Herrema and his son and later by Zac Cohoon of the Durham Region Federation of Agriculture. But when it became clear that there would be no deputations from the opposing camp, and planner Liz Howson then followed with a presentation explaining why she recommended approval of the application, residents began to get irate that the proceeding was one-sided. Mayor Barton struggled at times to keep control of the proceedings as residents expressed indignation at not having the opportunity to ask questions or make comments. When the fire chief Phil Alexander spoke in response to written concerns about fire suppression, a resident shouted a question on how long will it take for the fire department to respond to a fire at Grainboys, to which the fire chief replied 8 minutes, a mis-statement of the true time of 13 minutes. From there, things deteriorated as residents hurled more questions such as whether the department has an aerial ladder truck to combat fires in 60 foot silos (the fire chief said no). Residents noticed that councillors rarely made eye contact with the audience, keeping their eyes down for most of the meeting. One resident said that it seemed that the councillors had all come to the meeting already with their minds made up, which made it seem the event was staged by council to push through an unpopular development. There were three motions to make last minute changes to the by-law amendment. Two new conditions require Grainboys to submit a fire safety plan and conceptual drawings. A modification was made to a condition that requires Grainboys to produce a weed control plan. Grainboys must now adhere to federal weed regulations in order to bridge a gap in the provincial and federal regulations. However resident Conrad Richter says the change will not be enough to ensure that no noxious weeds arrive with the many tonnes of foreign seeds that will be imported each year. After the vote the councillors remained transfixed in their seats as residents shouted at them. At least one councillor was visibly shaken by the anger and heated accusations that continued for many minutes. Kresho Petrovich, the CEO of Grainboys who was seated in the front row, left the meeting at the earliest opportunity. Dave Barton later said to a reporter that he deliberately did not call attention to the applicant during the meeting fearing that the crowd would turn on him if they knew he was present. Can Uxbridge Fire Dept Fight Fire and Explosions at Grainboys? Resident says it's a "new and unusual high fire risk". March 27 – In a letter sent this week to Uxbridge Council, Goodwood resident David O'Leary wrote that the proposed Grainboys operation is a "new and unusual high fire risk" for Uxbridge Township and questioned whether the fire department has the resources and ability to cope with this dangerous risk. Seven of grains that the company processes using a stone mill are known to produce dangerous combustible dusts. Operations that produce these dusts pose a "significantly higher risk of fire, explosion property loss and loss of life" and must adhere to more stringent requirements under the Ontario building, electrical and fire codes. O'Leary points out that the Grainboys application does not mention what classification the proposed facility will be. Public safety has been "woefully overlooked" in the planning process, he writes, adding that that there was no mention of sprinkler requirements, on-site water pressure and flow volume capability, or backup generator capacity in the applicant's submissions. O'Leary believes that the mill must be classified as a "Class II Hazardous Location" under the Ontario Electrical Safety Code. Such locations are ones where "dust may be suspended in the air to the extent that explosive concentrations may be present" and grain elevators, flour mills and feed grinding and mixing plants are highlighted as the kinds of operations that present this risk. Under the Ontario building code, O'Leary says the mill likely will be classed as a "Group F, Division 1 High Hazard Industrial" facility because the highly combustible and explosive materials constitute a "special fire hazard". As O'Leary points out in his letter – which was copied to the fire chief, Phil Alexander, and the chief building official, Brian Pigozzo – there is no pressurized water hydrant capacity in the Goodwood area. Water has to be brought in by tanker or enough water has to be stored on the property. The company has proposed to build a pond to store water for firefighting, but this week the fire chief told Council that the pond will not be acceptable to him. He said that there must be an enclosed storage tank of sufficient size. In answering questions about his department's firefighting capabilities from Goodwood resident Bev Northeast, he pointed out that the department cannot get an accredited tanker shuttle service for Goodwood because the fire hall is too far away. The fire chief also told Council that he wasn't sure if sprinklers would be needed at the Grainboys facility, but did point out that recently there was a silo fire in Port Perry, suggesting that the silos at the Grainboys operation may be a risk that requires sprinklers. In his eight minute appearance before Council on Monday he did not highlight the hazard of combustible dust. 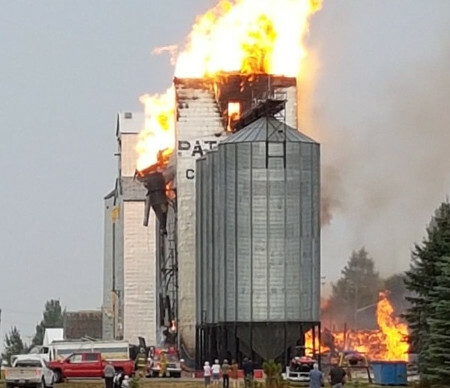 An explosion and fire at a grain elevator in Crystal City, Manitoba, last year illustrates the dangers that grain-processing operations pose. Grain dust in a silo exploded and caused a fire that quickly spread to the town's commercial centre, destroying a hardware store. The province concluded that a spark within the elevator ignited the grain dust, causing the explosion. Dozens of homes in the Goodwood area are within a few hundred meters of the proposed Grainboys mill, so the danger of explosion and fire is significant. With response times from the Uxbridge and Stouffville fire halls between 12 and 13 minutes, a fast spreading fire caused by explosions could be devastating to the community. In its response to questions and comments from the public submitted on March 21, Grainboys dismissed concerns about fire suppression, writing that the "Township of Uxbridge Fire Department has completed its review and had no objection to the approval and has no other fire safety concerns at this time." In fact, that review was limited to the question of whether there is adequate access to the site for firefighting equipment in the event of fire. In a telephone interview in January, Ken Maynard, the fire prevention officer of the fire department who wrote the approval letter, said that the review did not address any specific details such as the availability of water. Residents of Goodwood are deeply concerned about the Grainboys operation and the risks it poses to the community. The applicant's failure to address fire suppression, and its cavalier attitude to their concerns, has only intensified their worries. As a recent survey of residents shows, 93% of residents are opposed to the Grainboys mill. "Major inconsistencies" that the planner has ignored. March 27 – To win approval for its proposed grain-processing mill, Grainboys made a promise to buy grains and seeds from local farms. This promise is crucial. Without it, its business would not qualify as an "agriculture-related use" under the the Oak Ridges Moraine Conservation Plan, and its zoning application to build its new mill on rural land would fail. In 2001 the Ontario government decided to protect the ecologically sensitive lands of the Oak Ridges Moraine, a giant sand bar left behind by melting glaciers 12,000 years ago. This sprawling area of 1,900 square kilometres is protected from uncontrolled development, and farmland in particular must be preserved. The rules are strict: no farmland can be used for industrial developments unless those developments directly support local farms. The Grainboys business, operating as Port Royal Mills in Aurora, said in its planning documents that it does not buy grains directly from farmers. The company said "[n]o grain is delivered directly from field." However it also said that if its plan to build in Goodwood is approved, it will begin buying grains and seeds from farmers in Durham Region. But can we trust the company to do what it says it will do? After a contentious nine months since the mill proposal was revealed at a public meeting in June 2018, the company changed its story. In its response to public comments published in the council meeting agenda for February 25, it made a new claim: "In recent years we have contracted a local grower in Lindsay area in the Kawartha Lakes region to grow our triticale grain that used to be brought in from Manitoba." Up to this point the company had said nothing about direct farm purchases despite repeated criticism that it wasn't buying locally. Why did the company choose to make this claim at this late stage? Was it worried its application was in trouble? Were those repeated criticisms eating away at the application's credibility? The claim seemed to pay off because the town planner, Liz Howson, accepted it at face value in her report to council and cited it as evidence that the mill will benefit local agriculture. She concluded that the mill "has the potential to be directly related to local farm operations and support agriculture generally and locally." She ignored the company's original statement that "[n]o grain is delivered directly from field" in Aurora and how this statement directly contradicts the company's new claim about buying triticale wheat from the Lindsay area. For those who have taken the time to study the company's application documents, and have followed the public comments and responses, the company's credibility has become a serious issue. For Goodwood resident David O'Leary, sorting out the company's claims about what it imports, and from where, has been an exercise in frustration. In a letter to Uxbridge Council this week, he listed the company's evolving story in a timeline of documents that shows "[m]ajor inconsistencies" in the amounts and sources of the grains and seeds the company uses. "What is clear, is that it is all confusing." Back in April 2018 the company said "approximately 80% of the grain is supplied from the grain producing Counties and Regions in Ontario including Durham Region" and made no mention of any imported grains or seeds. Then in August 2018, the company said it "reviewed the origin of milled grains and seeds" and revised the numbers to 70% from Ontario, 20% from Manitoba and Saskatchewan and 10% from the United States. It repeated these numbers in its response to public comments last week, adding that the grains are from Canada only and that "imported products consist of seeds only". With these numbers adding up to 100%, the company is saying that none of its seeds come from outside North America. As O'Leary points out, "[m]ajor inconsistencies present themselves" when we check Industry Canada's Canadian Importers Database. The company, operating as Port Royal Mills, is listed as a major importer of six grain and seed products. Some of these seeds such as poppy and sesame are "not grown in North America at all," which leads O'Leary to conclude that "there must be a component that is imported from overseas in the planned operations of the proposed mill." In spite of the Industry Canada evidence, the company has never revealed in its documents or written responses what it is importing from outside North America. This is important because, as O'Leary points out, in Third World countries "cleaning standards are anticipated to be not as high as in North America." He adds that "[t]hese foreign countries are also host to weeds that are not native to North America" and "history is full of examples of damaging, non-native invading species" arriving from such countries. In his letter, O'Leary asks council "to determine, and make public, a Consistent, Verifiable & Full Accounting of the sources and percentages by tonnage of all seeds and grains to be processed at the proposed mill." In a final fit of exasperation he adds: "We cannot decide on what we do not know. We cannot manage what we do not understand." The lack of trust only deepens when one looks at what the company says about truck traffic. In planning documents submitted to the township in April, the company says that the current operation in Aurora has "approximately ten (10) ingoing and outgoing trucks per day." In the same document it says that the new operation will have the same number of trucks arriving and departing each day. However, when it was pointed out that the new operation will be two and half times as big, and truck traffic might therefore reach 25 trucks a day, the company revised its Aurora numbers downward. 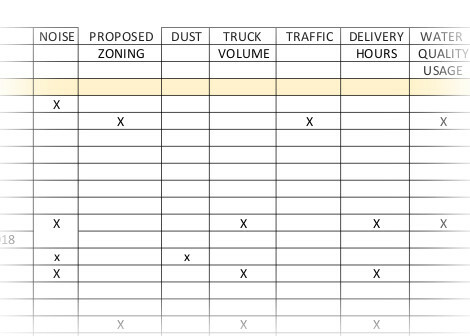 In its August 2018 response to public comments it claimed that the real number of trucks per day at Aurora is four. Magically this 10 to 4 ratio is the same ratio as the size of the new mill to the size of the old mill, and that allows the company to stick with its 10 trucks a day number for the new mill. Truck traffic is one of the biggest concerns of residents in Goodwood. This issue came up repeatedly in public comments and at meetings. Goodwood already suffers from unrestricted traffic passing through the hamlet on two regional roads, and for many residents the prospect of another 25 trucks passing through daily is alarming. But what numbers are the real ones? Much of the zoning application depends on trust and on what the company says it will do. There have been notable failures of trust. Goodwood residents are asking, does Grainboys deserve our trust?" Many said they would move if protections against development were ended. April 20 – A survey conducted by the Goodwood Conservation Association has found that 93% of Goodwood area residents oppose the Grainboys mill. The grain-processing mill is proposed for the 12 acre property at 351 Durham Highway 47, just east of the hamlet of Goodwood. The proposed property is less than 300 metres from the Ridge Road residential community where many residents are angry with the proposal and with the politicians who support it. Over 60% of residents who moved to the Goodwood after the Oak Ridges Moraine Conservation Act was enacted in 2001 said that the legislation was a factor in choosing to live in the Goodwood area. If the Oak Ridges Moraine protection from development were to end, over 70% of residents said that they would move away. But Goodwood residents are not opposed to all development. Two thirds said that they would be comfortable with more residential development in the area, and about a third said that they would also be fine with commercial and institutional development such as stores, shopping centres, hospitals, schools, and government facilities. Few residents in the Goodwood area supported industrial development such as factories. When responses from the rest of Uxbridge Township are included, 89% of respondents said that they do not believe that the grain-processing mill is an appropriate development for Goodwood, suggesting that opposition to the mill is widespread across the township. So far 149 people have completed the survey, 97 from the Goodwood area. The full results can be viewed here. Take our survey on development and the protection of rural lands in the Goodwood area. It takes only 2 minutes! It's huge! It will have 18 silos rising as high as 60 feet. The processing plant itself will be an acre in size. Impervious surfaces will cover 3 acres. And the plant will run 18 hours a day. The company claims in its application that this is "small-scale", but there is nothing small-scale about it! There is a residential community just 280 meters away. About half of Goodwood's residents live within 1 km of the proposed mill. Many of these residents moved to Goodwood because they thought the community was protected from development by the Oak Ridges Moraine legislation. But the company is using a loophole to get permission to build this mill so close to homes. And the silos will tower way above anything else in Goodwood. They will be up to 6 stories high, far exceeding any structure in Goodwood. The noise coming from the mill will be loud and continuous – for 18 hours a day. The company says that noise levels will be about 45-50 decibels. According to the World Health Organization exposure to this level of noise continuously is harmful to health. At the company's existing plant in Aurora, a sound recording showed that noise levels could be even higher, over 70 decibels. Grain processing inevitably produces dust, including the most harmful form called PM2.5. This dust can travel for miles. The company claims that it will have equipment to capture dust but it admits that dust will be emitted from the plant. The company has not adequately addressed the PM2.5 risk. The company initially claimed in its application that 10 tractor-trailer trucks arrive at its existing plant in Aurora daily and the same number of trucks will arrive at the new plant in Goodwood. Yet the Goodwood plant will be two and a half times the size of the Aurora plant. How can the number of trucks be the same? 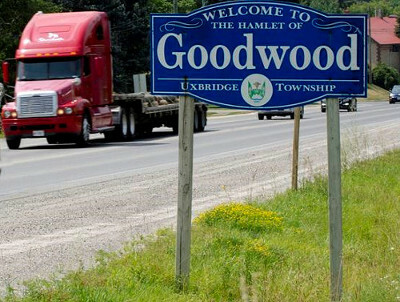 When residents complained about truck traffic in Goodwood, the company tried to lower that number to 4 trucks a day based on a new calculation, but residents are not convinced. Dust is highly explosive. Grain processing produces a lot of dust. How fires will be contained is a big question. There is no source of water on or near the property. The company says that it will store run-off water in a pond dug on the property. But we don't believe that run-off water alone will be enough to keep the pond filled, and groundwater from a well will be needed. The company does not plan to dig a new well and says that it will use an existing well that supplies a small bungalow. How will this one well supply the company's operations and keep the pond filled too? The Goodwood property, with its 12 acres of fertile sandy soil, will be taken out of potential farm use forever if this mill is built. The Oak Ridges Moraine legislation was supposed to protect farmland from unbridled development. The company said that the property is too small to support farming operations, yet two of its immediate neighbours are running successful farms on fewer acres. While it is true that the property cannot support mechanized corn and soybean farming, it is more than capable of supporting a fresh produce farm or a market garden. The company is a major importer of food commodities such as poppy seeds, sesame, millet, and sunflower. These seeds come from Third World countries that don't have the resources to control weeds like we do, and they come with nasty weed seeds that can be very harmful to agriculture. The worst of these weeds are so bad that the federal government bans them from seeds intended for planting. But seeds imported for food use are not subjected to the same government oversight. With over 10,000 tonnes of food grains and seeds processed annually, the chance that prohibited noxious weeds will escape to nearby rural lands is high. This mill should go in an industrial park where weeds can't escape and infest farmland. The loophole the company is using to get around the the Oak Ridges Moraine legislation is to claim that the mill will benefit local farms. It says it will buy grain and seeds from local farmers. But is it just saying that so it can use this loophole? The company says that its existing mill in Aurora does not buy grains from local farmers. So why should we believe that the new operation will buy locally? Why does council want this so badly? Uxbridge Council wants this real bad. The township needs more taxes but it can't expand its industrial tax base because of the Oak Ridges Moraine and Greenbelt laws. If this mill goes through you can bet that similar industrial developments will follow. Since much of the grain grown in Uxbridge is used for ethanol production, what will stop an ethanol plant from coming in next? These "agriculture-related" developments can be unrestricted in size and can locate virtually anywhere on township farmland. Don't let this door open! Goodwood residents disappointed but not deterred. March 15 – A long-awaited review of the Grainboys proposal to build an industrial-scale grain processing plant on rural land close to the hamlet of Goodwood was posted to the Township of Uxbridge website this week. In it planner Liz Howson recommends approval of the zoning application, saying that, in her opinion, "the proposed development conforms to Provincial, Regional and Township planning policy", "is appropriate", and "represents good planning". Howson attached a number of conditions. An environmental compliance certificate will be required from the province, and to get this certificate, a noise study and an emission report will be required. In addition, the company will be required to provide a detailed plan on how it will "mitigate any risk related to the spread of noxious weeds" and will be required to pay the cost of a weed inspector appointed by the township to "monitor the facility on a regular basis". A route plan for trucks will be required, with deliveries restricted to between 8 am and 5 pm. There will be no limit on the hours of operation which the company says will be 18 hours a day, five days a week. Other plans required include a water and sewage plan, a stormwater management plan, a well monitoring plan (to run for five years), a lighting plan, and a landscaping plan. In addition, a study of the project's impact on the underlying aquifer will be required. The public will have no opportunity to comment on any design or technical matters once the project enters the site plan and regulatory approval stages. All of the conditions imposed by the planner will therefore be assessed without public input and oversight. The planner made no mention about previously expressed misgivings about the company's inadequate responses to public comments and questions. Instead it seems that she went out of her way to address insufficiencies so that she could recommend approval. For example, she took the initiative to reach out to the provincial chief weed inspector to craft a plan for the monitoring of noxious weeds, a problem for which the company had offered no plan and had not sought expert advice. But the approach that planner and the chief weed inspector came up with fails to address the weed seeds problem because they have misunderstood the nature of the risks and where the critical control points lie. Residents are disappointed that the planner did not question key inconsistencies of statements made by the applicant. For example, in its Planning Justification Report the company makes no mention of the grains and seeds that it imports, yet the company is listed on the Industry Canada website as a major Canadian importer for six commodities including poppy seeds, sunflower seeds and sesame seeds. The company has never provided full details of its imports, only providing dribs and drabs of information at meetings and only when challenged. Imported grains and seeds present a major source of weed seeds which could harm nearby farms if weed seeds fall on soil and develop into infestations. Much of the justification of the proposal turns on what the company says it will do. It is not currently taking deliveries of grain from farmers directly but it says it will at the proposed location. This is important because if the company does not say it will buy locally then it cannot claim to be an "agriculture-related" use under the Oak Ridges Moraine legislation. But if the company is not upfront about what it imports, or backtracks on the number of trucks arriving at its facilities daily, or downplays the noise coming from its plant, then how can the company be taken at its word? It is disappointing that the planner did not question the company's word in her report. The residents of Goodwood are not deterred. They will meet soon to discuss the planner's report and to develop an action plan. For the residents, the planner's report is not the final word on the Grainboys application. The planner's report is available here. Growing unease about the application. February 26 – On Monday Uxbridge Council decided to delay the vote on the Grainboys grain-processing mill to April 8. Since the start of the year this is the fourth time council has delayed the vote. The delays seem to reflect a growing unease about the application and about the approval process. Both Councilor Gord Highet and the planner, Liz Howson, expressed concerns about the latest responses from Grainboys to public questions and comments. The company chose to answer the dozens of submissions received using a spreadsheet to link a series of stock answers to each question or comment. Councilor Willy Popp noted that the company did not deal adequately with questions about truck traffic. Council directed that the planner's report must be released "no later March 11th, 2019". The planner's recommendation to approve or refuse the Grainboys application is crucial. Council generally follows the planner's recommendations when it votes on zoning applications. Planner's report expected March 11; council to vote on April 8. February 21 – Responses to public comments about the Grainboys mill proposal from over 100 people are posted on the Township of Uxbridge website. The undated and unsigned document appears to be from Kresho Petrovich, the semi-retired founder of Port Royal Mills who is spearheading the application from his home in Pickering while his sons run the business in Aurora. Earlier responses to public comments came from the company's planner and consulting engineers, but it appears Mr Petrovich prepared these latest responses himself. Comments and questions were categorized under topics such as "noise", "traffic" and "rodents" and a spreadsheet was used to match them to a set of stock answers. Few of the answers contained specific or new information; many simply referred to previous responses from 2018. To those who had deep concerns about the proposal and had posed detailed questions or comments, the responses were disappointing, and looked like they were aimed at providing the barest answers required for the vote to proceed. Now that the responses are in, the planner, Liz Howson, can prepare her report, which now is expected to be ready for council on Monday March 11th. Council will vote on the mill zoning application on April 8th. The company's responses can be found here. If you are concerned about the mill this is the time to let your councilor know how you feel! Let your councillor amd the mayor know what you think about the mill – before Council votes. Here are the phone numbers. Reports published late in the application process raise questions about fairness. February 21 – A batch of 11 documents in support of the Grainboys proposal for a mill in Goodwood were published by the township last week. Most are technical reports meant to bolster the company's zoning application for its property at 351 Regional Highway 47 in Goodwood. Included among the documents are the company's responses to recent public comments and questions; but others date back as far as April of last year. The late posting of technical documents long after the deadline for public comments has passed raises questions about the application process and whether it has been as open and fair as it should be. The application process has been plagued with irregularities from the beginning. Many residents of Goodwood knew nothing about the proposal until very recently. The township notified only the owners of properties adjacent to the proposed site and in June last year held a public meeting that was sparsely attended. As the largest development in the Goodwood area if built, with structures up to six stories tall, the township should have known that the project would interest far more residents than just the immediate neighbours. After the public meeting, comments and questions were answered by the company in August, but those answers were not published by the township for five months. Some residents believed that the company had lost interest and the project was dead. But long after the legal 150 day deadline was past when council must decide on zoning applications, the project seemed to be revived when the company was urged to hold an open house in Goodwood. The open house was just three weeks before council was expected to vote on the proposal – and more than nine months after the company first submitted its application. But the company did not make a presentation to explain what was proposed, instead it opted only to answer questions from the public. For many residents, this was the first they heard of the project and they did not know enough about it to ask questions. Then, at the end of January, it was discovered that Councilor Beach had a conflict of interest because her family grows grains. Under Ontario law councilors must recuse themselves when they are in a conflict of interest, and they must not discuss with or otherwise try to influence the other councilors. But Councilor Beach should have known from the beginning that she was in conflict. And she should not have gone on local radio to promote the open house on behalf of the company as she did in early January. As a proponent of the mill from the beginning she undoubtedly has influenced the other councilors. To the residents of Goodwood the late appearance of technical documents is just one more reason why this application process has not been fair. Many are angry that this was being put through without adequate involvement from the community most affected. 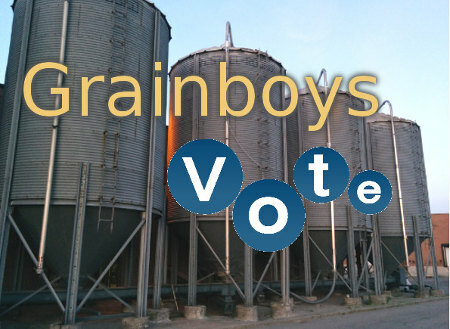 Council forced to delay vote because Grainboys has not responded to public comments. February 13 – At its meeting on Monday, Uxbridge council was forced to delay its planned vote on the Grainboys mill from February 25th to March 18th. The delay became necessary when Grainboys failed to respond to recent public comments. Without the company's responses the planner, Liz Howson, cannot prepare her report. Since there is no council meeting scheduled before February 25, council was forced to delay the vote. Mayor Barton argued that the vote could still be held on February 25th if the company responds soon, but council member Willie Popp took issue with the short time the public would have to review the planner's report. Initially council moved the vote to March 25th but changed it to the 18th when it was realized that the planner has a scheduling conflict. During the meeting residents were told that the company's responses had just been published on the township website. But on checking the website it was realized that the document was an old set of responses from August 2018. This old report is still on the township's home page as of this writing. The planner's report on the mill proposal was supposed to be published prior to the February 4th council meeting. But Liz Howson told council that Grainboys was looking at building the mill on a different property and, additionally, had not responded to public comments. Howson added, however, that Grainboys told her that the alternate site is no longer under consideration and that the company will proceed with the original mill proposal in Goodwood. Why is the planner's report so important? Because the members of council rely on the planner's recommendations and vote accordingly. In all cases that we have reviewed this is how council votes. Call the mayor or your councillor and let him or her know what you think about the mill – before Council votes. Here are the phone numbers. Here is the status report from the planner, Liz Howson. January 23 – Council received 79 submissions from residents in Goodwood and around the township – almost all objections. It also received a petition signed by 22 residents. This was after our emergency meeting of residents held in Goodwood on January 17. Read them all the submissions here, here and here. The week before, council received 16 submissions – all objections. Read them all here, here, and here. April 18 A suggestion for council (Letter), Uxbridge Cosmos. April 11 Ya just can’t please all the people all the time (Editorial), Uxbridge Cosmos. April 11 Am I wrong? Civics 101, Uxbridge Cosmos. April 11 New Grainboys by-law elicits angry letters from Goodwood residents, Uxbridge Cosmos. April 11 Council approve Grainboys Holdings rezoning, The Standard. April 11 Contentious Grainboys by-law approved during raucous meeting, Uxbridge Cosmos. April 10 Goodwood grain processor gets go-ahead , Uxbridge Times-Journal. April 9 Uxbridge council gives green light to controversial grain processing mill , CBC News. April 7 Uxbridge, Ont. council set to vote on controversial grain processing mill , CBC News. March 15 Uxbridge approves rezoning for grain mill with many conditions, The Standard. March 15 Group forms to save agricultural land, fights grain mill, The Standard. March 7 Uxbridge awaits spring to identify invasive species, The Standard. February 28 Grainboys response leaves Uxbridge councillors puzzled, Uxbridge Times Journal. February 27 ‘Comprehendable' report coming, non-resident fees going, Uxbridge Cosmos. February 22 The menace of Elgin Pond: Witch's hair entangles small town in fight over proposed mill, The National Post. February 14 Still no answers on Grain Boys Holdings, The Standard. February 13 Councillor opts out of Grainboys decision, Uxbridge Cosmos. February 12 Coun. Beach steps back from Grainboys decision, Uxbridge Times Journal. February 7 Grain Boys Holdings fails to answer residents' questions The Standard. February 7 'No answers from Grainboys, no Grainboys report' says planner, Uxbridge Cosmos. February 6 Report delayed on proposed Goodwood grain processing facility, Uxbridge Times Journal. January 31 Letters to the editor, Uxbridge Cosmos. January 24 Decision on Grainboys delayed, Uxbridge Cosmos. January 23 Uxbridge council delays final decision on Grainboys application, Uxbridge Times Journal. January 17 Council wants questions, residents want answers, Uxbridge Cosmos. January 17 Letters to the editor, Uxbridge Cosmos. January 16 Council delays Grainboys decision 1 week, Uxbridge Times Journal. January 10 Grainboys move plants seeds of discontent in Goodwood, Uxbridge Cosmos. Is the Mill an Unacceptable Risk? Listen to the noise levels emanating from the company's existing plant in Aurora. Watch a video of the slide presentation An Unacceptable Risk on Rural Land? presented before Uxbridge Town Council on January 7, 2019. Information handout to give to friends and neighbours. 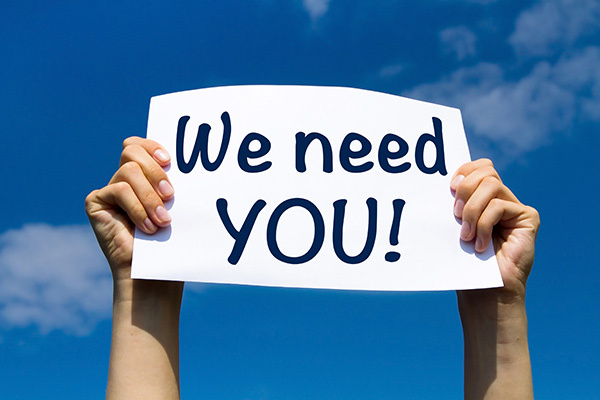 Read the letter from Bev Northeast, Chair of the Goodwood Ratepayers Association, submitted to Uxbridge Town Council on January 9, 2019 in the wake of the information session held at the Goodwood Community Centre on January 7th. Access all the Grainboys Holdings Inc. application documents on the Township of Uxbridge Planning Applications page (scroll down). Read Durham Region's review of the application prepared by David Perkins, Regional Planner, June 25 2018. Read the Comments on an Application for a Zoning By-law Amendment for a Proposed Grain Milling and Blending Facility submitted to Uxbridge Town Council July 2018. Read the Response to Public Comments from Zelinka Priamo Ltd on Behalf of Grain Boys Holdings Inc. submitted to Uxbridge Town Council January 2019. 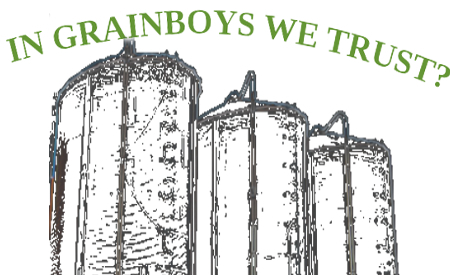 Read the Grainboys Holdings Inc. Proposed Grain Milling and Blending Facility: Failures Under the Oak Ridges Moraine Conservation Plan submitted to Uxbridge Town Council January 18 2019. Read the letter to Ingrid Svelnis, Chief Administrative Officer, submitted to Uxbridge Town Council on January 31, 2019 regarding a possible conflict of interest of a council member.